The main goal of lawn weed control service by a professional lawn care company is to protect your turf against weed infiltration. Weeds steal away nutrients and resources that your lawn needs to be vibrant and healthy. And, without proper treatment, weeds can quickly take over your lawn. For example, a dandelion weed can produce up to 15,000 seeds, thereby spreading and taking over your lawn in a short amount of time. The biggest defense against weed infiltration is to maintain a healthy and thick lawn. A thick and dense lawn will provide no space for the weed to grow and take root. To keep the lawn healthy, a combination of activity by your lawn care professional and the homeowner is needed. For example, fertilizing allows your grass to grow strong and healthy. Aeration of the soil prevents dried out and compacted soil which is the enemy of a healthy lawn. Regular watering applications also play a major role in keeping your soil and grass at optimal growth. Weed control services provide an assessment of the weed issues that are working against your lawn. There are hundreds of species of weeds, so an experienced lawn service can do an integrated plan for your outdoor spaces to prevent both growth of existing weeds and new seedlings from sprouting. Preemergent herbicides affect germinating seeds. Professionals use several applications of this herbicide throughout the year to prevent the spread of annual weeds. Postemergent herbicides are used to eliminate weeds after the plant is up and growing. These herbicides are absorbed through the leaves. Postemergent application can occur as your lawn care professional sees a need. They are typically applied any time the weeds are actively growing. Weeds detract from the desired look of the lawn by causing contrast in texture and color. In addition, weeds compete with your grass for water and nutrients which causes a thinning in the lawn. The best way to treat weeds for elimination, is to prevent them from sprouting in the first place. Contact a professional lawn care service and ask them about their weed control services today. You are on your way to the lush, vibrant lawn of your dreams. 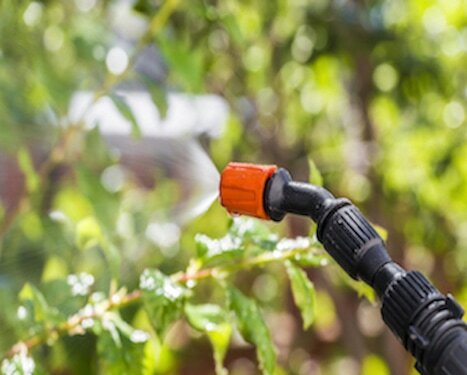 Mighty Green Lawn Care is known best for our weed control services in the Birmingham area. With pre-emergent and post-emergent applications, we will be able to keep your lawn weed-free all year long. Contact us today for a free estimate!